It’s a subject that feels too big to grasp. With The Poker Deck of the Drowning World, Nicholas Kahn and Richard Selesnick are making it something you can hold in your hands. This is not a true story, though it seems like it could be. 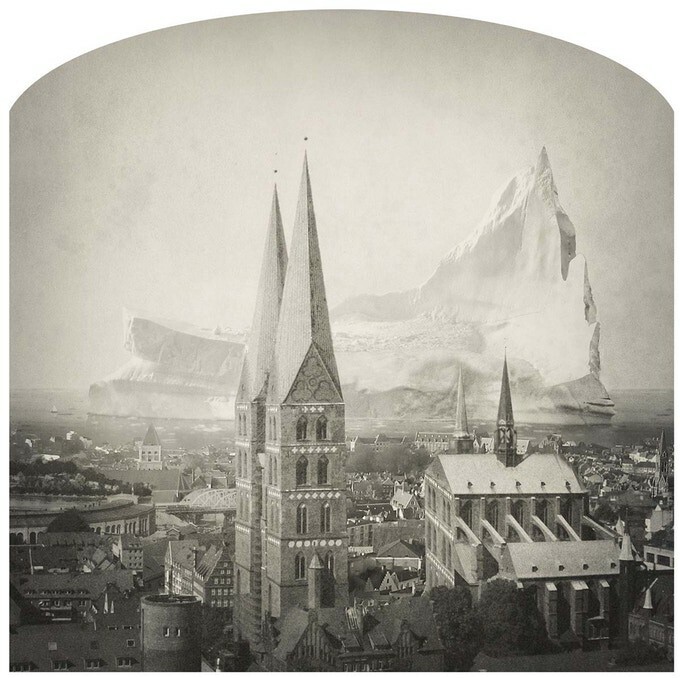 Eisbergfreistadt is a fiction dreamed up by artists Nicholas Kahn and Richard Selesnick some 13 years ago, elaborately staged in a series of exhibitions featuring photographs and sculptural relics from the Iceberg Free State. 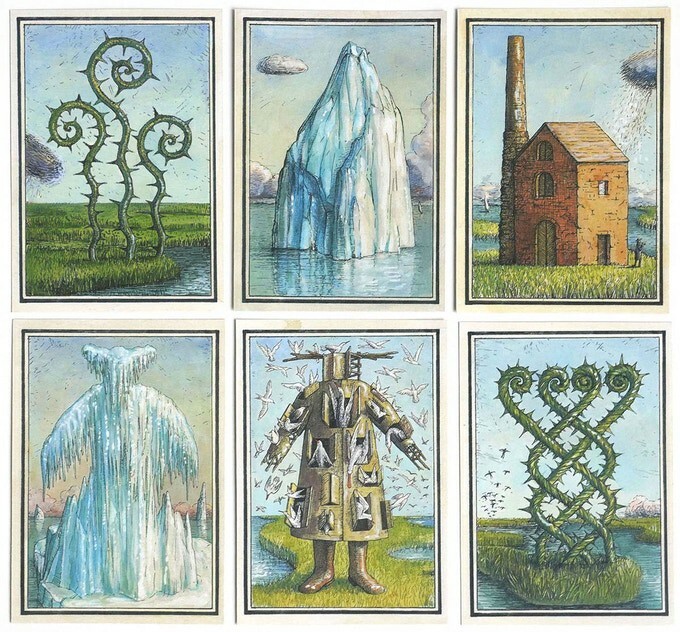 As part of Eisbergfreistadt, Kahn and Selesnick produced a limited-edition card deck featuring characters and imagery from the series; they liked the idea of offering playing cards to people who wanted to bring a little piece of the exhibition home. The initial run of 2,000 decks sold out quickly, and they’ve been fielding inquiries about whether they planned to reprint the deck ever since. Now they’ve launched a Kickstarter campaign to do just that. Icebergs still feature prominently in the updated imagery: along with weeds, chimneys, and birds, they stand in for the traditional four suits. When laid end to end, the images tell a not exactly linear, not totally comprehensible story about a world (perhaps our own, perhaps not) transformed by climate change. Imagined realities like Eisbergfreistadt are Kahn and Selesnick’s speciality. They’ve been documenting nonexistent worlds since 1988 in painstakingly constructed and costumed photography series and other media that have appeared at the Brooklyn Museum of Art, the Philadelphia Museum of Art, the Los Angeles County Museum of Art, and the Smithsonian Institution, among many others, as well as in three published books. Their work has chronicled colonies on Mars, a lost city in Siberia, and, most recently, the travels of the Truppe Fledermaus, an eccentric troupe of performers who make pilgrimage to abandoned places to put on shows for nobody. “It also involves us dressing up in ridiculous outfits,” Selesnick says. But the cards can just as easily resist interpretation, they say, and that’s all right. 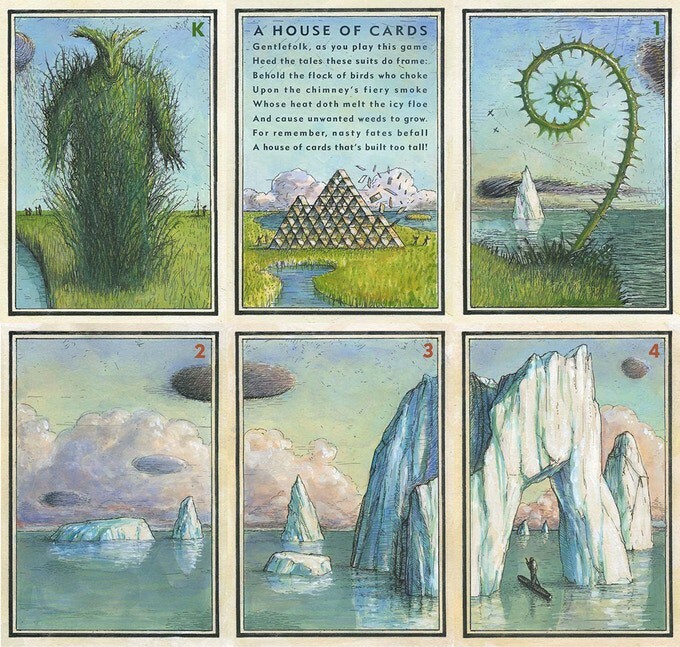 You can play a hand without pausing to consider the iceberg slowly melting into the sea or the factories belching fumes — and what the heck is the King of Birds supposed to be, anyway? But maybe, the cards’ subliminal sense of urgency will creep into your subconscious. The Poker Deck of the Drowning World is live on Kickstarter until April 25.